Carol is a native of Atlanta who attended Northside High School and University of Georgia. She moved to St Simons Island in 1996, and has three children and six grandchildren now living in Atlanta. She had a very successful real estate career in Atlanta with Harry Norman Realtors, beginning in 1972. When she moved to St. Simons Island she joined Sea Palms Realty until her move to Signature Properties Group in June of 2012, and now October 2017, she is excited to have joined GardnerKeim Coastal Realty, the newest company on St. Simons. In Atlanta, Carol was a Life Member of the Million Dollar Club and the recipient of The Phoenix Award. 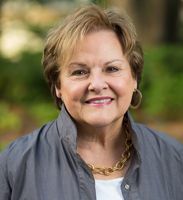 Since moving to St. Simons, Carol has become a Life Member of the Circle of Excellence and a recipient of The Oglethorpe Award. In September 2017 she received the Emeritus Award from the National Association of Realtors for her 45 years of full-time real estate. Carol has been a full-time agent for 45 years, so she has “seen it all,” every “up and down” of the real estate market and from very high interest rates to very low rates, as we have now. Her experience can help buyers and sellers in all aspects of the changing real estate “world.” She takes pride in the fact that she has a very strong referral business, both from past clients in Atlanta as well as from her “very happy” clients over the 21 years she has been working on St. Simons Island.